The best piece of advice we can give to travellers flying from Heathrow is that, unless they have several hours to spare before boarding, they must know for sure which terminal they are going to, where their check-in counter is and how much time they have to go through security. Even though this applies in every airport of the world, it becomes particularly true in the case of the main airport in London, which is a small city with plans for expansion. The good news is that Heathrow airport in London provides passengers with a quick and effective free transport system to go from one terminal to another. Terminal 2 (known as the Queen’s Terminal) is within a short walk from terminal 3. Notwithstanding that, in order to reach terminals 4 and 5 we will have to use the shuttle trains or buses. Moreover, the Picadilly tube line stops in each terminal, but bear in mind that you need to pay the standard fee for a really short journey. If you have a connecting flight at Heathrow, your airline will probably arrange the shuttle service towards your next boarding area. It must be said that this airport in the British capital is very well signposted, and that every terminal has different levels which can be easily accessed by using lifts. This way, the arrivals halls and the baggage claim areas are located on the ground floors, from where you can go down to the tube and the shuttle trains, as well as information offices, shops and currency exchange booths. Both in the airside and the landside, we will find charging stations for our mobile devices. The upper floors house the check-in desks, the security filters, the shops and the boarding gates. In terminal 5, the gates are divided into three zones, and we need to take a complimentary train to get around; if we take into account that gates are announced 15 minutes before the actual boarding time, we must remain alert and check information panels frequently. Once in the departures area of Heathrow, we may go shopping at designer brand stores and have a delicious pre-flight meal. Some of its most popular establishments are Caffé Nero, M&S Food, Caviar House & Prunier, Costa Coffee, Starbucks, Pret a Manger, Yo Sushi, Chanel, Zara, MAC, Louis Vuitton, Burberry, Harrods, Michael Kors, World Duty Free and Hugo Boss. 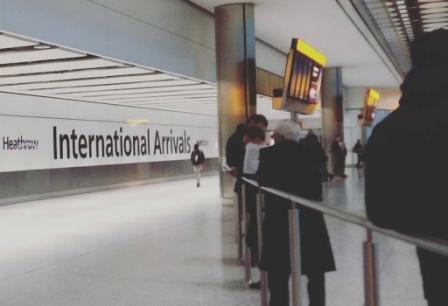 If you are having a layover in Heathrow and you need to spend the night at the airport, we recommend you book a room at the Sofitel hotel in T5; if your stay will be a longer one, you can check availability and prices of hotels in London. -Terminal 2 (the Queen’s Terminal): Aegean Airlines, Aer Lingus, Air Canada, Air China, Air India, Air New Zealand, ANA, Asiana, Austrian, Avianca, Brussels Airlines, Croatia Airlines, Egypt Air, Ethiopian Airlines, Eurowings, EVA Air, Flybe, LOT Polish Airlines, Lufthansa, SAS, Singapore Airlines, South African Airways, Swiss, TAP Portugal, Thai Airways, Turkish Airlines, United Airlines. -Terminal 3: Air Canada, American Airlines, ANA, ASIG, Cathay Pacific, Emirates, EVA Air, Finnair, Iran Air, Japan Airlines, Turkish Airlines, Virgin Atlantic, Vueling. -Terminal 4: Air Malta, Air France, Aeroflot, Alitalia, Azerbaijan Airlines, Bulgaria Air, China Eastern Airlines, China Southern Airlines, Delta, Etihad, Gulf Air, Jet Airways, Kenya Airways, KLM, Korean Air, Malaysia Airlines, Qatar Airways, United Airlines. -Terminal 5: British Airlines and partner airlines from the One World Alliance operating code share flights. As soon as we land in Heathrow we may connect our devices to their free WiFi, which requires a simple registration. Providing we do not want to use our smartphone or laptop, there are computers with broadband internet connection in all terminals; in order to find out where they are located, check the digital screens displaying terminal maps. T2: Plaza Premium featuring showers, bedrooms and spa, Lufthansa Senator and Aer Lingus Gold. T3: Club Aspire, No.1, Traveller bedrooms No.1, American Airlines, Delta, Emirates and Virgin Atlantic. Additionally, there is a Plaza Premium arrivals lounge in the public area. T4: Plaza Premium featuring showers, bedrooms and spa, Sky Team, Etihad, Qatar Airways. T5: Aspire (lounge & spa), and exclusive British Airways lounges.